Christmas chaos is well and truly upon us. 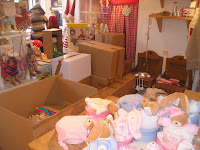 My laptop is bleeping every few minutes with orders, the phone does not stop ringing and we have just had a pallet of toys from France. The pictures say it all I think! 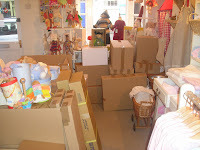 The shop itself is painfully quiet - you would hardly know it was Christmas - but maybe that's not a bad thing given that we are are rushed off our feet online, and - as you can see from the photos - there isn't exactly a lot of room for customers anyway!